Simply book your next residential meeting or events with a minimum of 10 rooms and you'll be rewarded with more bonus points and exclusive perks. That's not all, you would receive up to 70% bonus points if you book all premier rooms in your group booking. Just sit back, relax and our team of professionals will take care the rest for you. - Participating hotels: Oasia Hotel Downtown, Oasia Hotel Novena, Oasia Suites Kuala Lumpur, Malaysia, Quincy Hotel, Orchard Rendezvous Hotel, Rendezvous Hotel, Singapore, Village Hotel Albert Court, Village Hotel Bugis, Village Hotel Changi, Village Katong, The Elizabeth Hotel, Village Hotel at Sentosa and The Outpost Hotel at Sentosa. - Applicable for hotel bookings only. - To claim for the bonus points, members are required to submit the final invoice, contract/agreement and group rooming list to FAR MORE Rewards, within one month from the group's last check-out date. Bonus points will be awarded within fifteen (15) working days upon approval. - FMR Points are defined as the basic points awarded base on room categories for hotels. - If a member books 10 to 49 rooms in a group booking, the materialized group will qualify for 30% bonus on FMR points. If all the rooms booked in the group are Deluxe Plus or Premier room category, the materialized group will qualify for additional 10% bonus, earning a combined bonus of 40%. 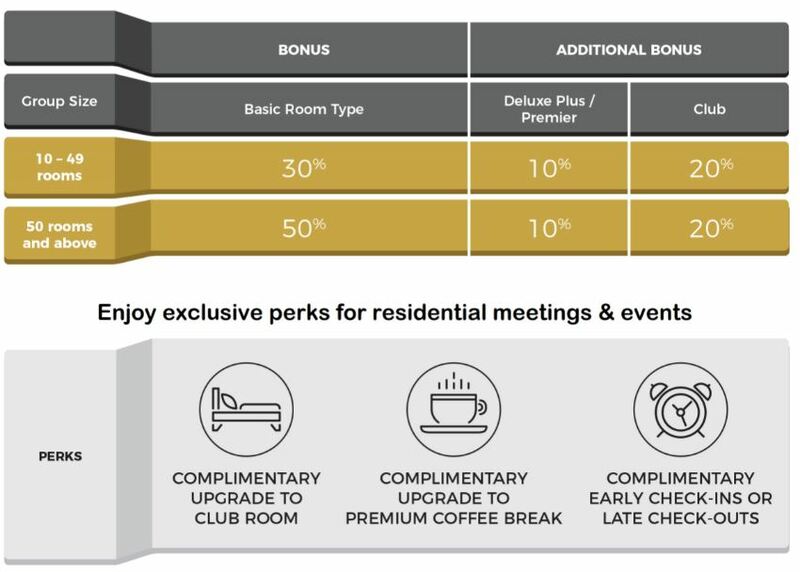 If all the rooms booked in the group are Club rooms, the materialized group will qualify for additional 20% bonus, earning a combined bonus of 50%. - If a member books more than 50 rooms & above in a group booking, the materialized group will qualify for 50% bonus on FMR points. If all the rooms booked in the group are Deluxe Plus or Premier room category, the materialized group will qualify for additional 10% bonus, earning a combined bonus of 60%. If all the rooms booked in the group are Club rooms, the materialized group will qualify for additional 20% bonus, earning a combined bonus of 70%. - One complimentary room upgrade to Club Room (with Club benefits) per group, is subjected to minimum 30 paid room nights, all rooms are Deluxe room type and above in the same group, and subject to room availability. - Room upgrade for stays at Oasia Kuala Lumpur, Malaysia, The Elizabeth Hotel, Singapore and Village Hotel at Sentosa will be the next available category. Room upgrade not applicable for The Outpost Hotel at Sentosa. - Free upgrade to premium coffee break with one extra snack is subjected to a minimum Event spend of S$4000 (before service charge & taxes). - Complimentary early check-in or late check-out is subjected to a maximum of 3 rooms per group with 15 rooms and above; any complimentary request is subject to hotel on-day availability. - Please quote your membership number when placing your meeting, events & group bookings in order to enjoy the exclusive members' perks. - All group stays must be materialized by 31 December 2019 to qualify. - FAR MORE Rewards reserves the rights to amend the terms and conditions without prior notice.